Global Views 9.92623 - Science and nature inspire us daily! And we have looked to the scientific muses once again here with our Geo Sculptures. 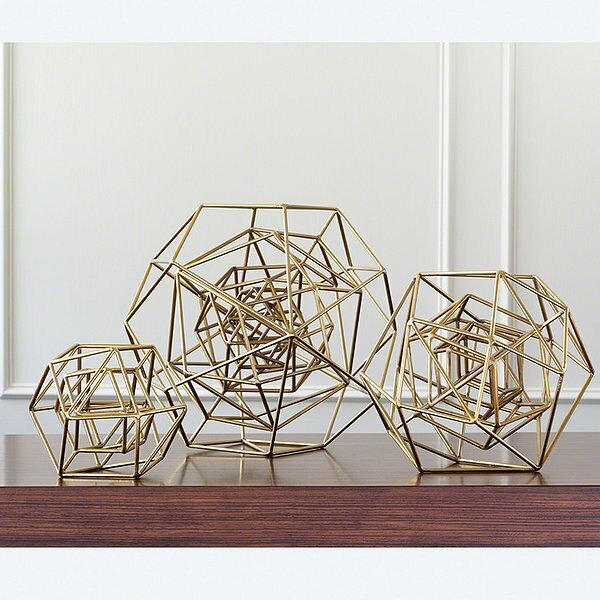 Taken from a drawing found in a scientific drawing, the iron sculptures give a very angled and molecular feel. The fantastic gold finish is made possible by a multi-step process that almost feels like an experiment in itself! The iron is first copper plated, then the copper is nickel plated, then finally flash dyeing the metals to a shiny brass finish. Shown as a set, but sold individually. Available in three sizes: small, medium, and large.